Heat oven to 350°F. Lightly grease cookie sheet. In large bowl, combine sugar and butter; beat until light and fluffy. Add vanilla and eggs; blend well. Add flour, cocoa and baking powder; mix well. Stir in toasted hazelnuts and chocolate chips. Divide dough in half; shape each into 10-inch log. Place logs 5 inches apart on greased cookie sheet; flatten each until 3 inches wide. Bake at 350°F. for 20 to 25 minutes or until firm when touched in center. Cool on cookie sheet for 10 minutes. With serrated knife, cut diagonally into 1/2-inch slices. Arrange slices, cut side down, on same cookie sheet. Return to oven; bake 10 minutes. Turn slices over; bake an additional 5 to 10 minutes or until cut sides are lightly browned and crisp. Remove from cookie sheet; place on wire rack. Cool 10 minutes or until completely cooled. Place candy coating in small microwave-safe bowl. Microwave on HIGH for 45 seconds, stirring once, or until melted and smooth. If necessary, microwave an additional 20 seconds. Drizzle over biscotti. *To toast hazelnuts, spread on cookie sheet; bake at 350°F. for 8 to 10 minutes or until golden brown. To remove skins, roll warm nuts in clean kitchen towel. Toasting hazelnuts loosens their peels; simply brush the peels away and discard. Dutch process cocoa has been treated with alkali to reduce cocoa's natural acidity. Dutch-process cocoa is darker and more richly flavored than regular cocoa. 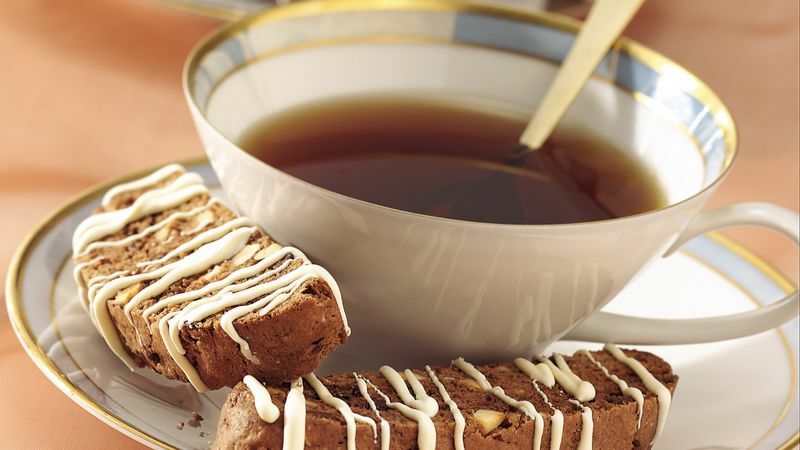 Biscotti prepared with regular cocoa won't look or taste as chocolaty as those prepared with Dutch-process cocoa. For elegant biscotti, drizzle with 3 ounces each of melted white and chocolate candy coating.